Pound chicken breasts to approximate ½” thickness. In non stick fry pan fry for about 2 minutes on each side. Add Keli’s Hawaiian Teriyaki Glaze and complete cooking. 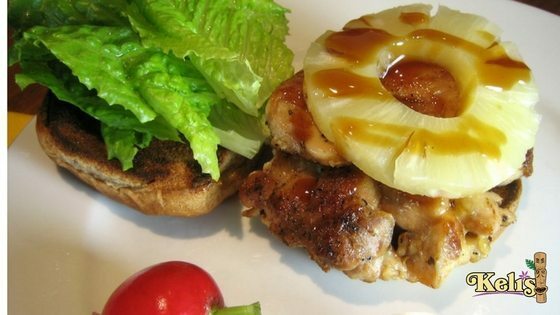 Place 1 pineapple ring on each chicken breast, top with cheese. Serve with lettuce and tomato on an open face bun.